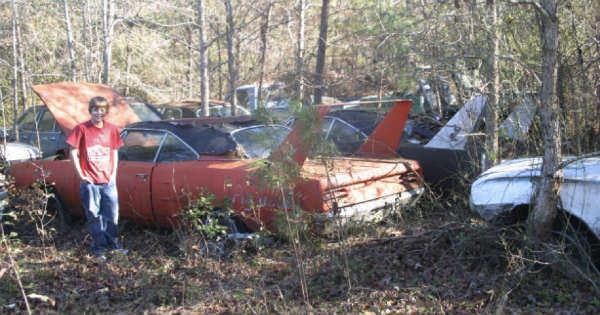 Father & Son Become Proud Owners of Two 70 PLYMOUTH SUPERBIRD CARS! - Muscle Cars Zone! Father & Son Become Proud Owners of Two 70 PLYMOUTH SUPERBIRD CARS! When you think of a 70 Plymouth Superbird, you`re probably thinking of that one time you saw it on NASCAR all those years ago. Only 920 of these were ever made, but they`re really beautiful and pack a huge punch, so people always wanted to buy them. 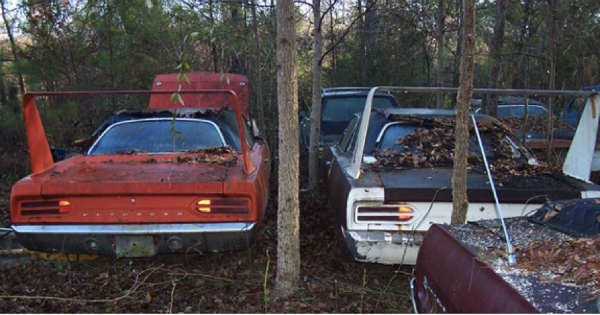 That was the case with two 1970 Plymouth Superbirds in South Carolina as well. Mike Hill always wanted to get one of these babies because he considered them the “ultimate muscle cars“. Having that dream since he was young, he heard of this guy in his town who actually owned one of them. Mike thought a lot about going over to the guy`s house and offering to buy the car, but there were rumors going around town that the guy is insanely jealous and won`t let anyone near his car, let alone sell it. Mike had no choice but to give up. However, later he decided to start building a Daytona clone, so he put up parts from a `68 and `69 on the back but hit a roadblock when he wanted to do the front section. He had no idea how to install the parts or even where to get them, so after a quick consultation with his friends, he and his son went to talk to Mark Thames, the owner of the Plymouth Superbirds that his town deemed “too radical”. Mark told him that he could have a look at the cars and took him out back. 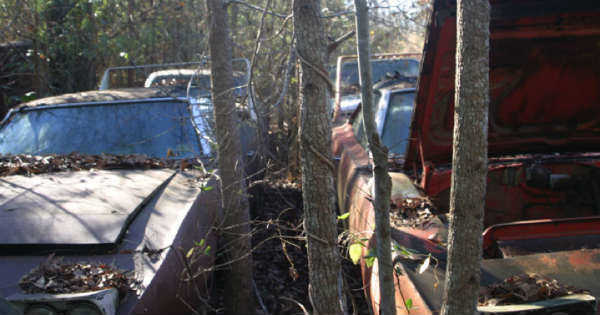 Mike was flabbergasted – two 70 Plymouth Superbird cars stood there, derelict and abandoned! He took some pictures of the cars and explained to Mark how this was a father-son bonding project. This was in 2007, but the cars weren`t discovered online until 2011 when Mike posted some pictures of them online. 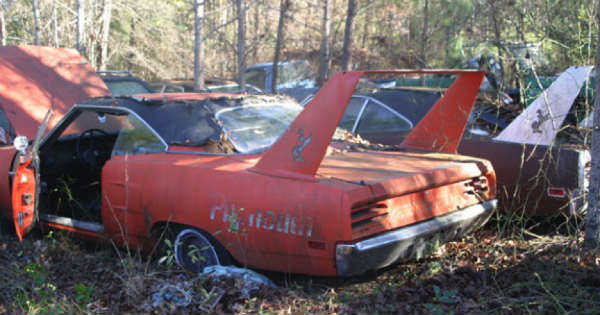 Mike left the 70 Plymouth Superbird owner his business card and a $10 bill so he doesn`t throw it away. A few months later, he had given up but he suddenly got a call from the owner asking if he was still interested. Of course, Mike said yes and immediately bought the cars before Mark could change his mind. However, Mark had some conditions – first, the cars can`t be resold and the only reason he`s selling them is because this is a father-son thing, so he wanted to see the dad in one car and the son in the other. Since the cars changed owners, Mike and his son have become great friends with Mark, the previous owner and now race bikes together. In 2014, Graveyard Carz heard about Mike`s Plymouth Superbirds so they offered to restore one of them. They changed what needed changing, spruced up the entire car both exterior and interior, slapped an all-white paintjob on it and voila – a 70 Plymouth Superbird was reborn! They`re all incredibly happy about this whole thing and are equally amazed when the crew rolls out the bird so that they can have a look. Mark has a face of no regrets, while Mike and his son Michael can`t get enough of their new Plymouth Superbird. As a cherry on top, the 2014 South Carolina State Figure Champ, Jennifer Liane Hill (Mike`s wife) has her picture taken on the spoiler just like in the old days! This is a great story and it says a lot about how with enough persistence and love for your craft, you can restore any old car to its former glory. These Plymouth Superbirds are no exception, and now one of them is looking as new as it was the day it left the factory, all thanks to Mike and his son Michael.